SM City Marikina will have a 3-day sale from March 19 to 21, 2010 from 10am till 12 midnight on the 1st day and 10am-10pm mall hours on March 20 and 21. 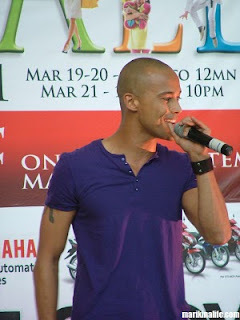 In preparation for the 3-day sale, SM City Marikina held a pre sale show last March 13 at 5pm featuring Pinoy Big Brother Celebrity ex-Housemate and model Will Devaughn. Will sang a few songs before the main portion of the show which was a contest to win a date with Will. Four lucky female contestants joined to get up and close with the celebrity hunk. Will also promoted the sale and thanked everyone for coming to the show. Catch up to 50% off on selected items mallwide and get a chance to win one of 6 motorcyles to be raffled off to lucky shoppers.